Although low volatility previously contributed to excessive risk-taking, the recent increase in volatility has not been accompanied by a proportionate decline in risk-taking. The migration of risks from banks to less-regulated sectors is a continuing concern. For example, non-bank institutions continue to increase their share of highly leveraged syndicated loans. Some market liquidity measures — the ability of market participants to sell assets with limited price impact and low transaction costs — signal a deterioration in liquidity. These changes have occurred along with a decline in the provision of liquidity by primary dealers, which could potentially reduce their willingness to buffer intense selling pressure. Reduced liquidity, migration of risks from banks to less-regulated sectors, and rising interest rates sound to us like the perfect financial storm potentially in the making. Indeed, the one area flashing red on the chart is interest rate risk. Gary Cohn, President and COO of Goldman Sachs, took to the radio last week to share his two cents on what’s likely to happen when the Federal Reserve finally hikes interest rates (after talking about it since what feels like the Paleozoic era). We believe Cohn is referring to exogenous events as opposed to actual derivatives like credit default swaps. But, of course, derivatives do have a nasty habit of blowing up at inopportune times. One area of significant financial risk to the U.S. financial system which the OFR can’t color-code because it’s hiding in a black hole is the capital relief trades that major U.S. banks and their foreign counterparts are conducting with unknown counterparties that could, potentially, teeter under market stresses caused by a Fed interest rate hike or simply rising rates. 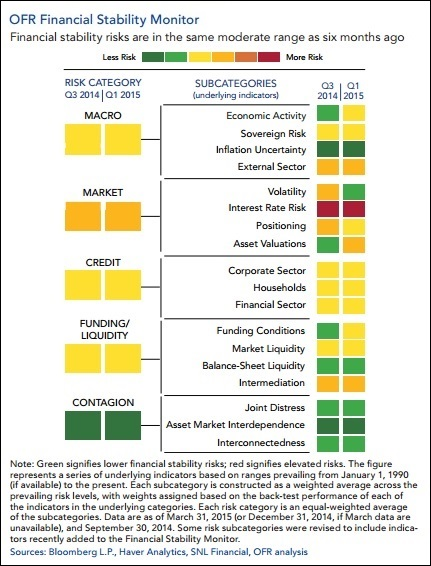 If we can’t quantify the amount of these trades; if we have no transparency on the credit-worthiness of the counterparties, is OFR really on solid ground with its color-coded warnings? When it comes to Wall Street, without the restraint imposed by the repealed Glass-Steagall Act, it’s always a red alert day for investors.